While the site has been inactive, I a have still kept up in the mobile device space. Recently I have been bombarded by similar questions by different people. Seems to be time to start updating this page again with content that will address these common questions. That it will be easy for me to just give people a link to go to instead of me repeating the same thing a hundred times. I have recently been working with a Blackberry Z10 for a piece to be posted on the site, and I must say that the Z10 now makes them an option when considering an upgrade. Using the new BB OS 10 UI makes you realize just how far they have come. It is one of the most pleasing UI experiences I have had in awhile. Will be more later when the posts go live. Nokia’s CEO, Elop had stated that Windows Phone was a better platform for Nokia’s future. It is hard to imagine how that is true versus the likes of Android, MeeGo, or even their own Symbian platform(which had begun to undergo changes that were starting to turn the tide for the platform). With Windows Phone Nokia gets a platform they can influence and even slighty alter, but they lose the Qt development ecosystem that they spent the last year building up and possibly their developer user base with it. They also lose having full control of their ecosystem from OS to application services. As one of the rare few who have a Symbian powered device in this country, I always run into those telling me to switch to one of the "leading" platforms. In the USA the popular choices amongst the tech crowd are Android and iOS based platforms. What these people fail to realize that without USA market share, Symbian is the most dominant platform. This is something I find myself explaining a lot lately. Looks like one application developer found this out for themselves. 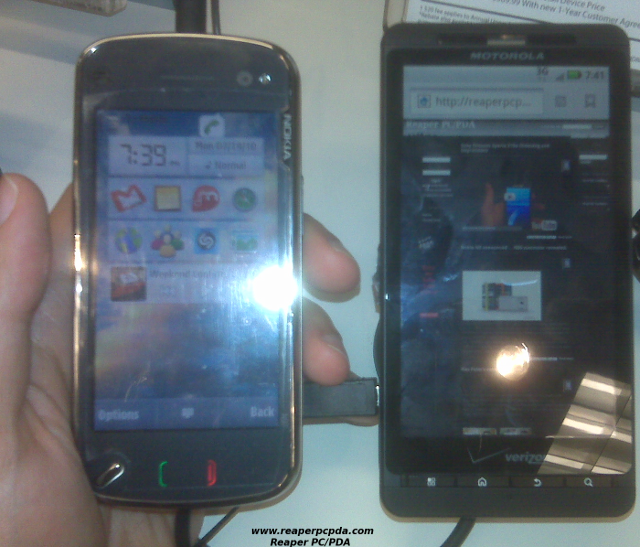 A new Droid device was released and of course I made my way to the nearest Verizon wireless store to check it out. Here I briefly interacted with the new Droid 2. As a qwerty equipped sliding touchscreen hybrid smartphone, it is in the same category as my current primary smartphone the Nokia N97. 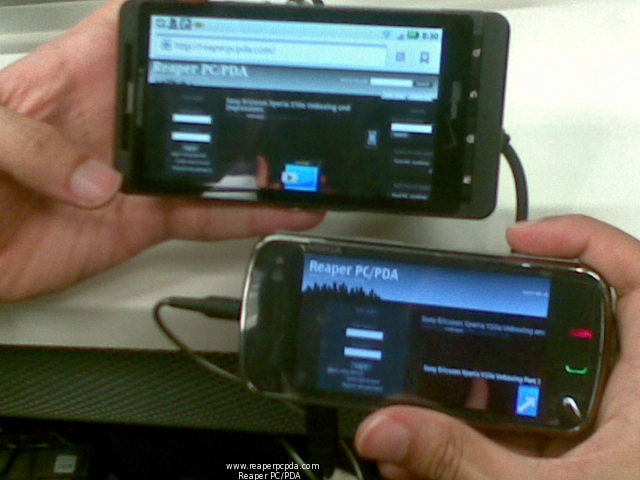 Here is a picture of both devices in their open position. The Droid 2 is a flat slider while the N97 tilts at an angle when open so the devices look quite different in size even though they are not very different in size when closed. I was passing a Verizon store and just had to stop by to check out the Droid X. The Driod X display was the center of attention today, and I had to wait to be able to step up to the counter. Just to show how large this device is, I put it up against my Nokia N97. Even though the N97 is not a small device by any measurement, it was still eclipsed by the Motorola Droid X.